la dulcie vita | festivals, fashion & frolicking. : exhibition : from Death to Death and other small tales. 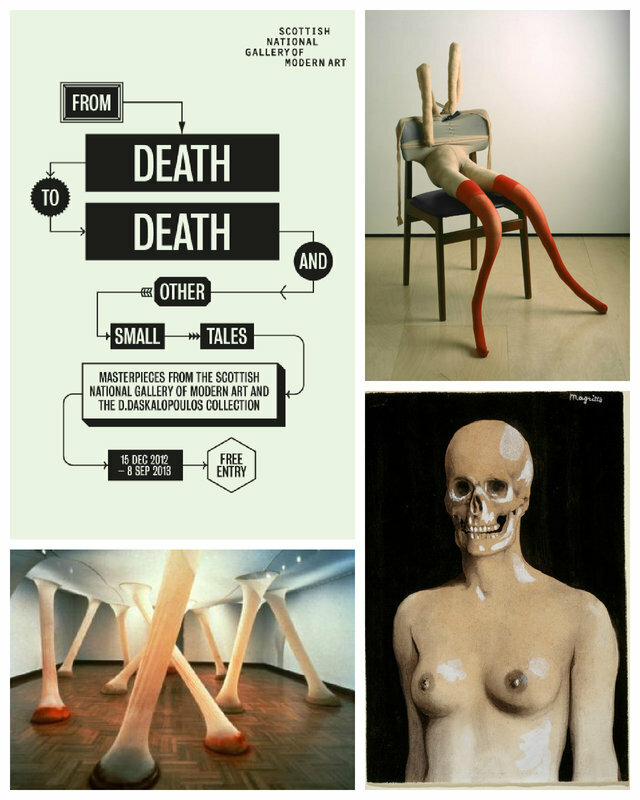 exhibition : from Death to Death and other small tales. In my post about going to Edinburgh I mentioned visiting the Scottish National Gallery of Modern art to see the 'From Death to Death and Other Small Tales' exhibition which featured work from the D. Daskalopoulos collection. It was one of my new years resolutions to visit more exhibitions and the like so it was great to go to one with so much work I loved! It was laid out as a kind of journey so you could walk through one room on to the next in a sort of order. The works (which varied from sculpture, to video installation, to painting...) were laid out thoughtfully; pieces from the Daskalopoulos collection juxtaposing with, but also informing, works from the gallery's permanent collection and vice versa with a running theme of the human body. The work not only varied in their mediums but also in their eras, influential pieces such as Marcel Duchamp's Fountain alongside mono-prints from YBA Tracey Emin. I think my favourite piece was Ernesto Neto's peculiar installation 'It happens when the body is an anatomy of time' (bottom left) which consisted of large ceiling high tubes made from something similar to tights and filled with various spices; cloves, cumin, saffron... it smelt amazing! I wasn't a huge fan of the video installations (I never am!) but I definitely would have liked more time to get properly immersed in this exhibition as I thought it was really well curated. I went to another exhibition in Bristol last week too, which I will write about soon. Have you been to any exhibitions lately?